How to change ringtone in your Android phone?- The Android phone you are using at this moment, is produced in millions all over the world. There must be more than 100000 users of the phone at the current moment. Have you ever thought, what makes your phone any different than theirs? Customisation is the answer. And one can’t simply deny the fact that customisation starts with changing our ringtone. This is probably the most basic thing you can do with your Android phone, regarding customisation. 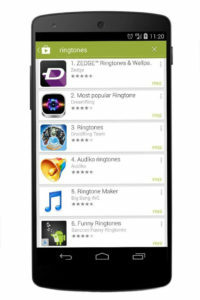 Hence, in this article, points are listed about how to change ringtone in your Android phone to help you as a guide. Change Ringtone in your Android Phone? When you are using an Android device, customisation is flexible in any field. This lets you choose different ringtones to play when different people call you. Apart from this, you can also create a customised ringtone of yourself and make it specific for specific people. Basically, this would let you recognise who is calling you without even looking at your phone. Every brand provides different and unique signature ringtones. The iPhone has a ringtone of its own and so does MI. Beside the official ringtones, they also provide you a unique stock. You have several ringtones to choose from and the options are vast enough, even at default. To browse the default ringtones provided by your phone just out of the box, you need to follow the following steps. Also, how to change ringtone in your Android phone can also be known by you after reading these steps. 1. From the home screen, you will find an option of “all apps”. Click on that to open the app drawer and then select “settings”. If your phone does not come with an app drawer, the option of settings will be available directly or on the drop down menu. 2. After you have opened settings successfully, scroll and find the option named “Sound”. 3. Select the phone ringtone option and it will display all ringtones which has come pre-installed. You would first have to choose between android system or stored music. The “android system” would let you browse through the pre-installed ringtones while “stored music” would let you choose one. You can choose a song as a ringtone or a simple ringtone itself which you have downloaded earlier. Such is the flexibility of customisation that is how to change ringtone in your Android phone. If you think that the default ringtones does not give you the level of customisation you want, you can go for “stored music”. This option was mentioned earlier already but the question is how can you get ringtones stored in your device. Well, the answer to that is that there are many ringtone downloading apps in the Play Store. Some of them are Myxer, Mabilo and RingDroid. The RingDroid is basically an application which allows you to cut songs to duration of 30 seconds. This would allow you to set the ringtone which will ring for 30 seconds on repeat. Mabilo and Myxer are legitimate ringtone downloading apps. Both of these apps lets you download the best ringtones available on the Internet. You can find your favourite after browsing through a vast ocean of ringtones and everything is almost free. Only some ringtones are paid, otherwise it does not cost you any money.